UNIVERSITY of Strathclyde Media Communications officer John Beaton was the man-in-the-middle for the Scottish Cup fourth-round tie between Hearts and Auchinleck Talbot last month. The match saw Premier League side Hearts run out eventual 1-0 winners against the only Junior side remaining in the competition and Category One referee Beaton was delighted with the appointment. “Officiating the match was the highlight of my career,” admitted the 29-year-old. “Tynecastle is a fantastic stadium. The fans are right on top of you and it makes for a brilliant atmosphere. Beaton had a busy afternoon, awarding a penalty to the home-side and producing seven yellow cards in an entertaining clash. But the referee enjoyed a strong performance, stressing the importance of displaying the correct attitude throughout the 90 minutes. “When the game starts, you go into autopilot as a referee. Much like a player I suppose,” explained Beaton. 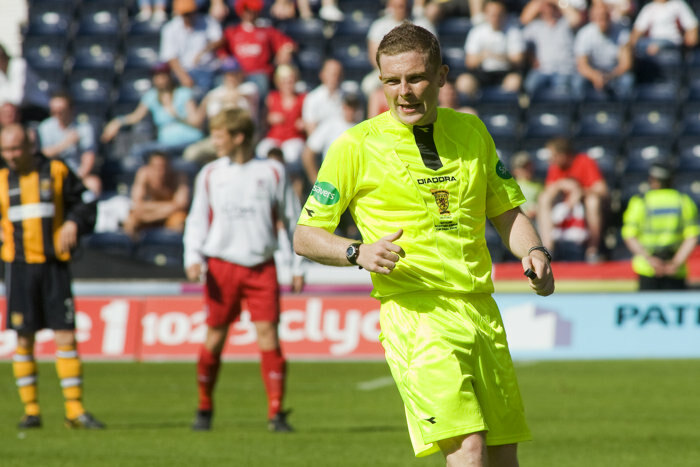 And with the new year ahead, the Motherwell-born official is hoping that there is more success to follow in 2012 as he prepares to take part in a UEFA training course later this month. Beaton said: “It was a great way to start 2012. It was my first visit to Tynecastle as a referee and it has given me an extra bit of motivation to keep working hard through the winter months. “I travel to Turkey at the end of the month for a UEFA introductory course for new FIFA referees before heading to La Manga in Portugal for an SFA winter training camp in February.